Warm weather means more time lounging outside which means the search is on for comfortable solutions that fit next to a BBQ and a pool and still look good. 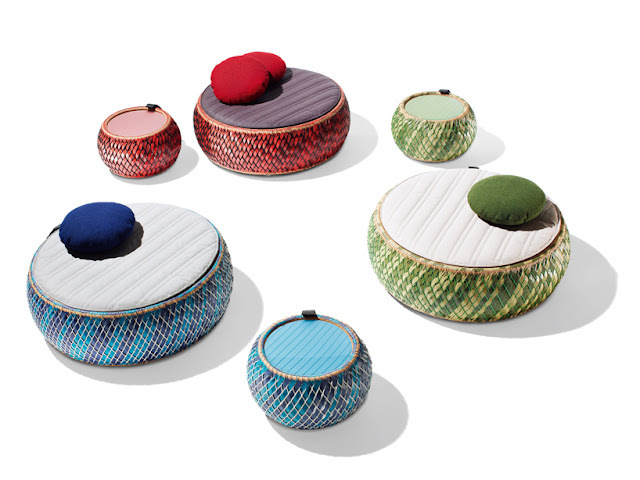 Outdoor furniture manufacturer's Dedon have teamed up with designer Stephen Burks for a new collection called Dala. Inspired by the improvised seating found in many communities around the world as well as the woven manufacturing process common to those areas, this line is a great combination of old and new. Made with recycled food and drink packaging as well as a recycled polyethylene structure, the colourful patterning is modern and handcrafted all at the same time. Available soon through Dedon.